Have your Birthday Party at Ceramica! Here's What Ceramica Offers For a Truly Stress Free Birthday Party! 2 hours in our party room, 5 helium balloons and birthday child’s choice of custom birthday plate from a selection of 5 templates (shown below). A dedicated Ceramica staff member who will be assisting your group while completing your custom birthday plate. A full size refrigerator and freezer available for use. Food and drinks are welcome, however, the party family supplies their own paper products and serving and eating utensils. Party family is allowed to arrive 15 minutes prior to start time for setup and additional decorating if desired. Due to the fragile nature of our studio and as a courtesy to our other customers, parents are expected to supervise the behavior of the children in all areas of the studio and provide chaperoning to the restroom. 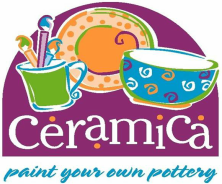 It has been Ceramica's experience that birthday party attendees do best painting pottery with minimal parental assistance starting at 5 years old. Therefore, for the best value for your birthday party money, Ceramica will not accept birthday party bookings for children younger than 5 years of age. Due to the fragile nature of our surroundings and as a courtesy to other customers, the following items are prohibited from use in the studio: piñatas, bouncing balls of any size, noisemakers, silly string and/or any objects we deem unsafe. $50 deposit due at time of reservation - non-refundable but is applied to the cost of your party. $50 deposit due at time of reservation – non-refundable but is applied to the cost of your party.